One of my favorite toys that I received as a child was the Blue Streak Freight Train Set. 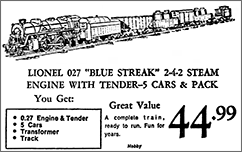 Released in 1973, the Blue Streak was an entry-level O-27 gauge train set produced by Lionel. 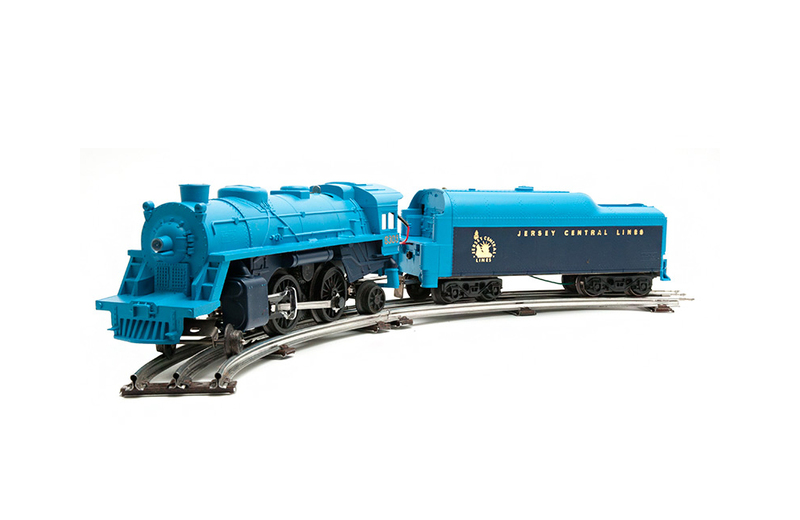 The set included a blue Jersey Central Lines Steam Locomotive with a 2-4-2 wheel configuration and attached Tender car. Lionel integrated several features into the locomotive to increase the fun factor, including a working headlight, a smoke unit, and “the electronic mighty sound of steam” – a chugging sound that emanated from a speaker built into the Tender. Five additional train cars and a caboose completed the set, including a red Canadian National Railway (CN) Hopper; a green Burlington Nothern (BN) Gondola with canisters; a gray Erie Lackawanna (EL) double-door Box Car; a yellow Union Pacific (UP) Flat Car with stakes; and a blue Republic Steel Gondola with canisters. The train ran on a combination of six sections of straight track and eight sections of curved track. The complete track layout measured 54” x 27”. The set was powered by a 50-watt Trainmaster Transformer that enabled both forward and backward train operation. Lionel Trains were inducted into the National Toy Hall of Fame in 2006. These train sets remain popular with collectors and train enthusiasts to this day. Puppet, Super Soaker, and Twister were named 2015 National Toy Hall of Fame inductees.